We are delighted to announce The Captain Cook Birthplace Museum has won a Sandford Award. The Sandford Award is an independently judged, quality assured assessment of education programmes at heritage sites, museums, archives and collections across the British Isles. The Awards focus on formal, curriculum-linked education opportunities offered to schools by heritage sites, although recognition is also made of informal learning such as family programmes. The Sandford Award is managed by the Heritage Education Trust in partnership with Bishop Grosseteste University, Lincoln. The Trust is the only body in existence able to provide independent quality assurance to historic properties and collections which run education programmes. Congratulations to our education team! Fancy doing something different – Why not join the Middlesbrough Museums team as a Volunteer. free training…all in a creative environment. Opportunities available at all Middlesbrough Museums & Galleries. See our 'What's On' page for the latest exhibitions, activities and events. See 'Collections' and 'Niu Treasures of the Pacific' for information on our new outdoor sculpture and exhibit. 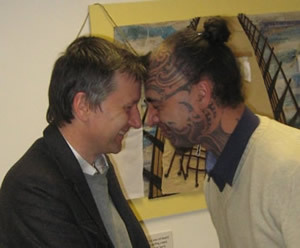 TFM's Graham Mack gets a traditional Maori welcome to the Museum from George Nuku. Changes to our opening times will be posted to our facebook page. 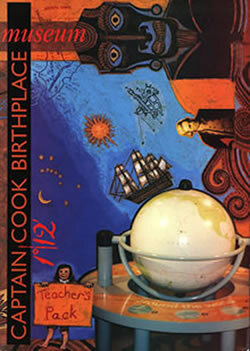 A teacher's pack has been produced by the education staff at the museum with the help of local teachers. The pack includes information, worksheets and activity trails. The pack is available from the museum shop priced at £3 or £4.00 mail order.